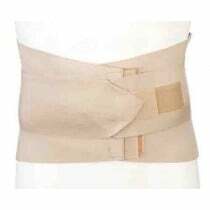 Back Braces and Lumbar Support Belts are important safety equipment to aid in proper body mechanics and posture. This is essential for individuals in jobs with heavy lifting or post-surgical recovery to aid in lumbar stabilization as well as to prevent injury for individuals with bulging discs, chronic and acute back pain as well as other back conditions. Back braces for posture guide and decrease stress on the spine. It's important to use the belt properly and still engage the core or it may weaken these muscles. There are a variety of styles of back support belts for office chairs and lumbar braces to meet different individual needs. Form fitting Rigid Braces are well fitted to limit mobility of the spine by approximately 50 percent. These braces are made with rigid composite materials or molded plastic forming guides to limit motion. This is helpful after an individual fractures a bone in the spine or has back fusion surgery. Some braces also provide needed compression to alleviate pain and inflammation after surgery such as the V2 Back Brace. Rigid back braces have structure and more coverage and therefore tend to be heavy and hot while worn. Occupational Braces are industrial support braces imperative for individuals who are lifting heavy objects regularly to prevent unnecessary back injury. This straight back brace ensures the lifting is done with the back straight and not bent forward requiring the leg muscles to do the heavy lifting. Shoulder straps can be added to hold the brace up. When not lifting, straps can be removed to hang at the waist to be ready when lifting is performed again. The straps also act as a reminder to lift properly. For extreme heavy lifting, additional lumbar support straps can be added. Corset Braces can also be worn as occupational braces. Corset elastic braces are recommended when it's necessary to limit motion with lifting or after spine surgery. The Triple Pull Elastic Lumbosacral Support is elastic with flexible pulls and four flexible stays to prevent rolling. It adds support and stability to alleviate low back pain and weakened abdominal muscles. Vitality Medical also carries low profile braces with a two-panel system such as the VerteWrap Back Brace.This daily back support belt is ideal for individuals prone to lower back pain by acting as a posture guide in the L-1 to L-5 vertebrae. Many back braces are worn over clothing but the VerteWrap is worn underneath clothing to be less invasive for everyday wearing that's not detectable. Because it's next to the skin, it's made with breathable material. Back Pain: Are back belts helpful? Do they work? Oh, gee! My name is Brad Heineck. I’m a physical therapist. I just demonstrated a technique on how not to live resulting in back pain. We're going to talk about back belts and the benefits of back belts. Back belts as a tool for body mechanics in keeping your back safe, it can be a good tool. I’ve done research on it to find out what the studies say, the official studies. They go all over the place from yes, they’re a good thing. They decrease stress on the back. They decrease injuries too. They support the body too much. They help weaken the core muscles and they're no good or they just don't do anything at all. Overall, when I have a patient with back pain and I talk to them about back belts and if they like them and they’ve been using it at work, I think there's nothing wrong with them if you use them right. That's what I had to go over regardless of the research. People wear them. You need to use them properly. This is one of my favorite back belts. Most back belts that you'll find now will be made of elastic, with Velcro just like this one. It’s stretchy. This one happens to have the shoulder straps, which I really like. Well, I’ll get into the reason for the shoulder straps a little bit. As far as the position of the back belt, you’re going to go right around the lumbar spine. In the back, if you look at your belt line, it should cover that half way down a little bit lower. The nice Velcro strap and there you go. Now you're going to find if you are working with a factory, you do lifting out in intervals where you lift for 5 to 10 minutes unloading a truck and then there's another 20 minutes before you do any lifting, you certainly don't have to have the back belt on all the time. You can loosen it up. I see people in warehouses, et cetera that do just that. There's nothing wrong with that. As far as the shoulder straps, why did they have shoulder straps? Is it to hold it up? That's one reason. When it’s loose, it doesn't drop down and it's right there. When you're ready to use it, it's there. But the other thing is like before when I came in, bending over to lift up the chair, the shoulder straps are there. They’ll move on your shoulders and you'll feel that because you forget you’re wearing a back belt. But when you move forward, they tug on your shoulders. It reminds you, oh yeah, I should lift properly. When you put the back belt on, that's not the green light that you can lift like that. It’s there as a reminder to lift properly. You don't see weightlifters put their heavy-duty leather belts on and they’re lifting properly. It's just there for additional support for injury reduction. That’s what the shoulder straps are for. This back belt and if you’re going to purchase a back belt, I like that once they have the straps just like and now the Velcro is getting in my way a little bit. There we go all. We can actually have additional lumbar support straps, elastic bands. If I'm going to pick up something heavy, I strap the main one on and then I’ll pull like this and put extra support there and give extra support and then do the lift, get the chair out of the way back. Then you're going to continue to lift. You can be able to take these and loosen them up a little bit so you get some relief there. It's just an additional support that some back belts have. I really like it. I suggest getting that add-on with it. Back belts are great. Use them properly. Don’t overuse them. I think you'll have better results with your back over longer.